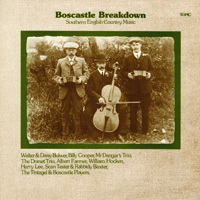 An important collection of field recordings made between 1940 and the late 1960s, which focus upon the traditional instrumental music of rural England. Most of the musicians featured were born towards the end of the 19th century and developed their musical skills in the years before the Great War. The carnage of World War 1, the movement towards towns in search of employment and the influence of mass media, all served to bring about a decline in country music. This recording captures some of the finest surviving performers and the repertoire they played for social dancing in country pubs and village halls.